Who says summer road trips have to be boring? Load up the family and hit the open road: the trip will fly by when you bring an audiobook from DPL! Unlike your child’s Nintendo DS or iPod Touch, audiobooks don’t require charging and they will entertain more than one person at a time, including the driver. 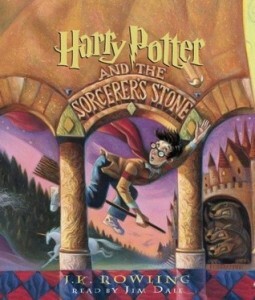 Harry Potter series, read for you by Jim Dale: The whole family is sure to love the expertly performed Harry Potter series. Jim Dale’s narration is absolutely perfect; even if you’ve already read the novels, you’ll find something new to love in the recordings. If your children are a bit younger, there are admirable recordings of the Magic Tree House series. For the kids who’ve already read (or aren’t interested in) HP, try Artemis Fowl or Percy Jackson. 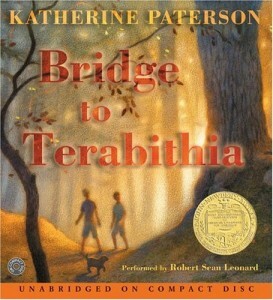 Bring a box of tissues along with the kids’ classic Bridge to Terabithia, warmly brought to life by narrator Tom Stechschulte. The poignant story of Jess and Leslie has been a favorite since Katherine Paterson penned it in the ’70s. For kids 10+. Recordings of Suzanne Collins’ runaway hits The Hunger Games, Catching Fire, and Mockingjay will be a hit with everyone: mature themes and violence probably make this too grown up for the littlest ones, but don’t let the YA label fool you – adults adore the series too. For kids 12+. In Nerd Girls: The Rise of the Dorkasaurus, 8th grader Maureen risks life and limb – ok, she risks embarrassing herself in front of the whole school – to stand up to the popular girls who bully her. A funny, relatable story about friendship and the perils of middle school. For kids 12+. 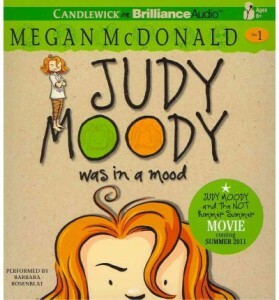 Megan McDonald’s Judy Moody series makes for a charming listening experience – Judy’s misadventures show kids how to handle things when their grand plans don’t work out, and narrator Kate Forbes captures her spunky spirit. Just Grace, about another spirited grade schooler, is a fun choice for the kids who’ve already enjoyed Judy Moody. For kids 8+. All kinds of great books for kids are available from DPL, from classics like The Chronicles of Narnia and Harriet the Spy to popular new hits like The Mysterious Benedict Society and the Warriors series. Princesses, Sports, Dragons, Animals – whatever your child is interested in, we have an audiobook for it! 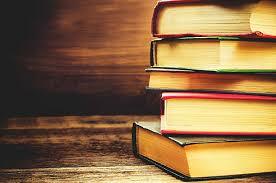 *Age recommendations reflect the guidelines printed by the publisher, not DPL’s opinion. Always take your child’s unique level of maturity and experience into account when helping him or her choose books to read.